At the end of the 19th Century, the United States Custom Service was in need of a large warehouse building near the waterfront where customs agents could appraise imported merchandise and assign duties. In the days before income taxes, the federal budget depended on customs duties as a major source of income. In 1892 Congress authorized the new warehouse and the site of the Christopher Street Market, two blocks from the piers, was decided upon. The trapezoid-shaped lot was bounded by Greenwich Street, Christopher Street, Barrow Street and Washington Street. The land, most of which was owned by Trinity Church, was purchased for about $4 a foot and construction began later that year. Willoughby J. Edbrooke, chief architect of the Treasury, worked with William Martin Aiken and James Knox Taylor to design a massive Romanesque Revival structure – the largest in Greenwich Village. Each floor covered an full acre of storage. 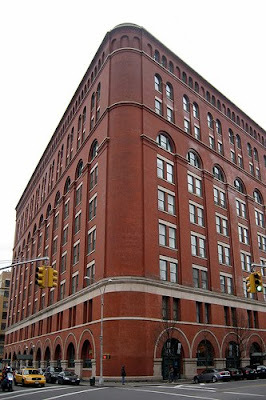 Known as the United States Appraisers’ Warehouse, its substantial brick walls were three feet thick at the base. The architects diminished its enormous bulk with vertical granite courses and horizontal, recessed arched bays. Fourteen years after construction was completed in 1899, federal income taxes were enacted and, little by little, the importance of the custom assessors was diminished. 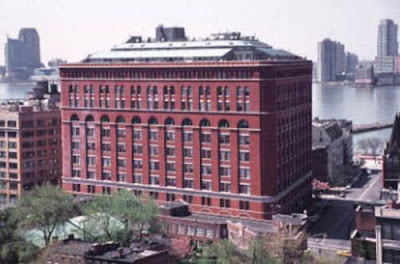 The government, coveting the 10 acres of storage, took over the structure as a general warehouse and renamed it the United States Federal Building. During the Great Depression it was converted into the National Archives Record Center which additionally contained a post office and office space for government agencies. By the 1970s, however, the offices were relocated, the post office closed and the building sat vacant and essentially abandoned. In 1976 the General Services Administration deemed the old building to be Government surplus, much like an extra filing cabinet or metal office desk. The Government now had the problem of how to dispose of a red brick elephant. The sheer size of the structure made viable conversion into something useful challenging at best. It sought the counsel of the New York Landmarks Conservancy. What happened next forever changed the way Federally-owned historic properties will be transferred to public hands. A deal was drawn up by which the government would turn over title to New York State’s Urban Development Corporation for $10, which in turn could lease the property to a developer for 99 years. The developer would make payments of $10,000 per apartment, plus interest, to the Landmarks Conservancy’s loan fund. This money would be distributed to owners of historic properties, like brownstones and churches, for renovation and restoration – a windfall for the Conservancy of approximately $5.5 million for the apartments and about $100,000 annually for the next 75 years from commercial rents. After a bumpy start with different developers, the partnership of Teitlebaum and Rockrose began conversion of the building. After years of planning and six years of construction, the $115 million project was completed on June 10, 1988. Now called The Archives, its 479 apartments (with 242 different floor plans) had views of the Village or into the newly-created interior courtyard. It was the largest residential conversion in New York City history. 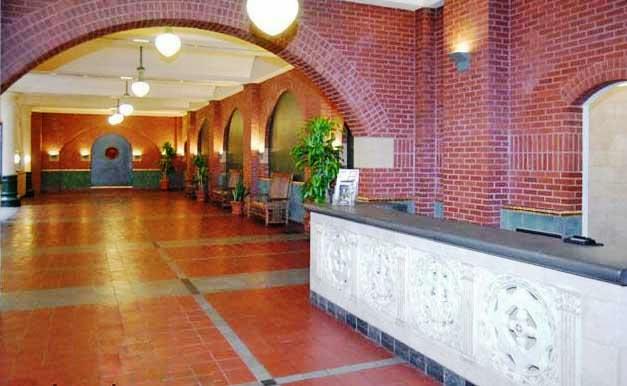 The immense lobby features vaulted ceilings, wrought iron and terra cotta details. Arched windows in some apartments rise 16 feet. Laurie Beckelman, then executive director of the Landmarks Conservancy, told The New York Times that the restoration was the largest project completed under the Surplus Property Act of 1949, meant to promote the restoration and recycling of historic properties. ''This proves that it certainly is possible both to preserve a valuable old building and to put it to good use,'' she said. The revolving Historic Properties Fund, made possible largely through the Archives project, has provided millions to owners of historic properties across the city.